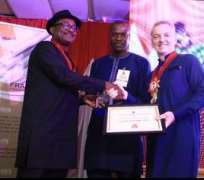 Shell's General Manager, Contracting and Procurement, Antony Ellis, also bagged the PETAN Chairman Outstanding Achievement Recognition Award for promoting the course of Nigerian oil service companies. Both awards were given after careful evaluation of the contributions of the international and national oil companies, to local content development. “The awards are in recognition of Shell's sustained effort in shaping direction of local content implementation in Nigeria through support for local asset ownership, growth of indigenous companies and human capacity development at all levels,” said PETAN Chairman, Mazi Bank-Antony Okoroafor, while announcing the awards at the dinner in Port Harcourt on Saturday, November 30. Executive Secretary, Nigeria Content Development and Monitoring Board, Simbi Wabote, presented the corporate award which was received by SPDC's General Manager External Relations, Igo Weli, on behalf of the Managing Director of SPDC, Osagie Okunbor. The awards are the latest in the recognition of Shell's pioneering role in Nigerian content development. In 2016, PETAN had honoured SPDC with the Distinguished Achievement Award (Corporate) while the Managing Director of Shell Nigeria Exploration and Production Company (SNEPCo), Bayo Ojulari, received PETAN's Professional Award in the same year for his notable contributions to the development of Nigerian content in the oil and gas sector.